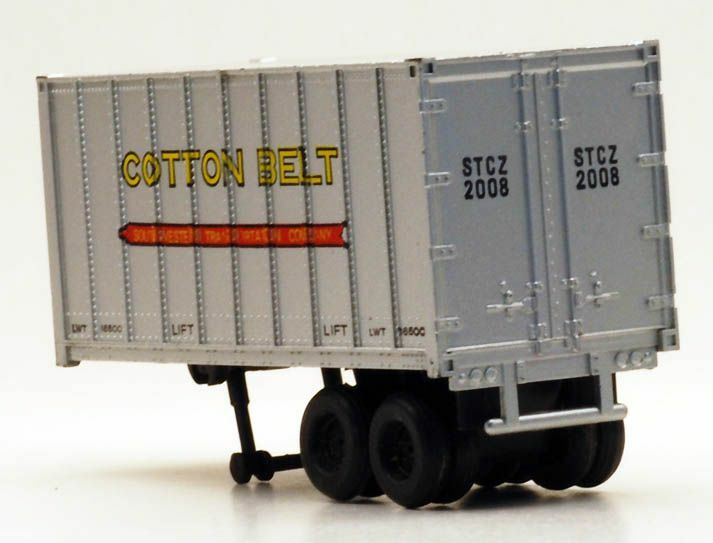 AHM's 50-foot Flat Car with Trailers release is a 1970s offering with Taiwan origin marks on the flat car. This is a Kader tooling and one of a handful of models AHM imported from Kader in the mid-to-late 1970s. The flat car measures 50-feet exactly end to end and not counting its couplers. 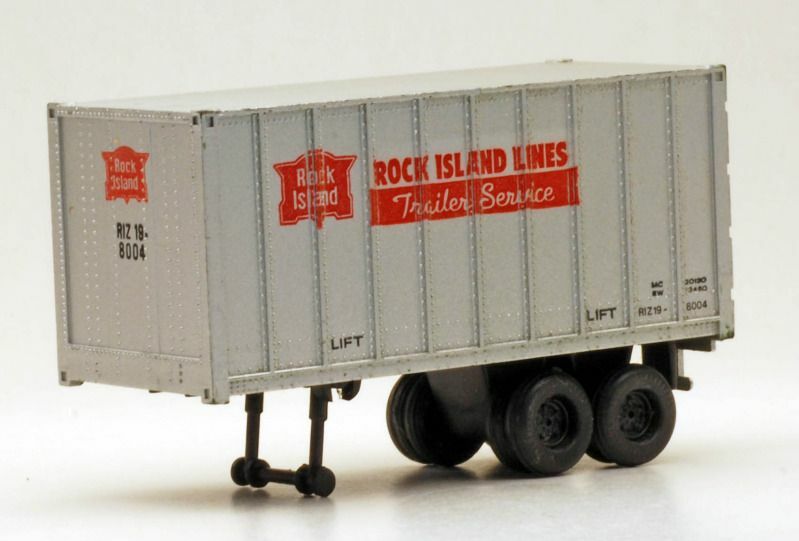 The trucks are friction bearing design and match models in Bachmann and Lionel-HO lines of this same period, as Kader produced them all. The trucks have plastic wheels and axels and X2F couplers are mounted to the trucks. The trucks are held by plastic plugs securing them to the car's underframe. The flat car underframe is a one piece casting and the bed with simulated wood deck snaps into the underframe. Weights are housed inside the two pieces. The trailers ride in separately cast and applied frames that plug into the flat car bed. A brake wheel stands in a pocket located on one end of the flat car. The trailers are removable from the flat car. The trailer's upper structure is a single casting measuring 20-feet long, 8-feet wide, and 12-feet tall including the bogie wheels. The trailer itself has an 8-foot height. No origin/maker marks are present on the trailer toolings. The underframe is black cast plastic and the wheels are multi-part separate pieces that snap into place without cement. The trailer stands may be swung up for positioning on a tractor. A hole is provided that appears able to work with tractor cabs from TYCO. I do not know of any tractors produced by AHM to accompany and support this trailer release. 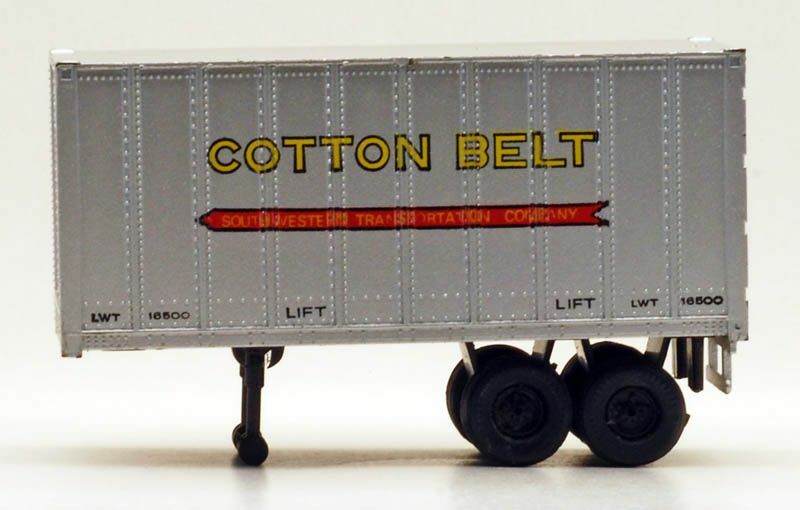 The flat car with trailers has a total weight of 3.25 ounces.